Visually impacting way to demonstrate an AC and DC generator. 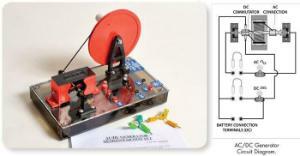 This unique hand generator is an easy yet effective way to teach how AC and DC electricity is produced. Banana plugs can be inserted into the different connectors to change from AC to DC electricity. Simply turn the hand wheel and the included bulb will light up. The generator is a permanent-magnet rotating armature generator. The dimensions of the base are 225mm L x 145mm W x 30mm D.